Public clouds offer incredible flexibility and scalability, but these benefits often come with risks in terms of security and performance. Fortunately, there is a better solution. 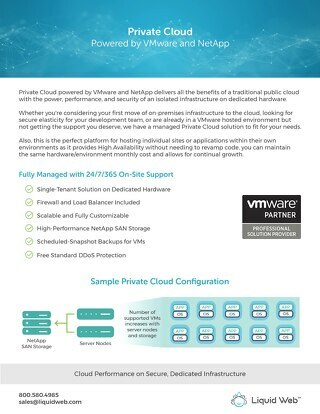 Whether you're considering your first move of on-premises infrastructure to the cloud, looking for secure elasticity for your development team, or are already in a VMware hosted environment but not getting the support you deserve, we have a managed Private Cloud solution to fit for your needs. 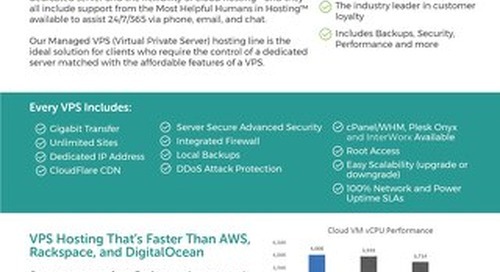 Private VPS Parent allows you to create your own private cloud environment, within which you can create, move, resize or destroy any number of virtual instances. 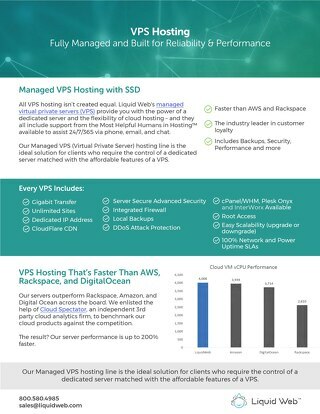 Verified by Cloud Spectator as up to 200% faster than the competition, our Cloud VPS provides you with the power of a dedicated server and the flexibility of cloud hosting. 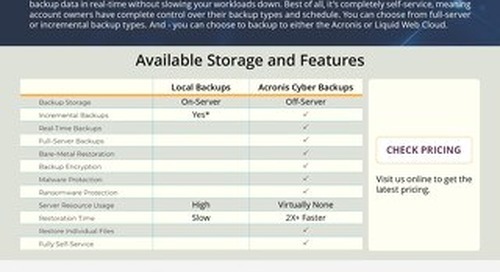 The Guardian Backup and Recovery solution at Liquid Web includes a block-level off-site backup solution that pairs perfectly with our Dedicated Server solutions, so you can focus on your business. 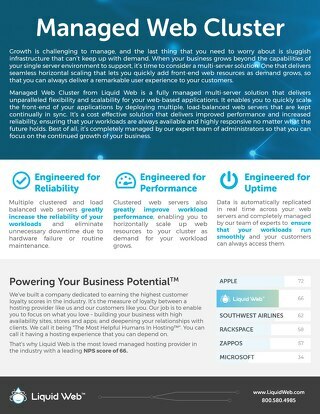 The tier 1 data center facilities at Liquid Web make the difference between a mediocre hosting experience and a performance-driven, reliable, and secure experience. Find out about our data centers. 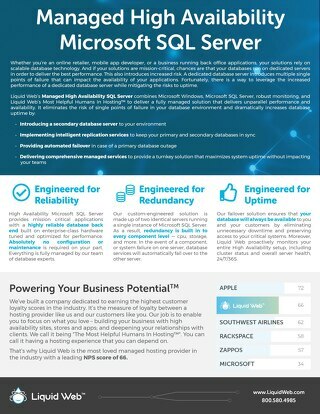 Managed High Availability Microsoft SQL Servers combine Microsoft Windows, Microsoft SQL Server, robust monitoring and fully managed hosting to create a reliable, hands-off hosting solution. 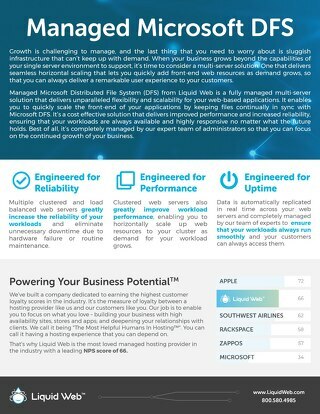 Liquid Web's Managed Microsoft Distributed File System (DFS) is a fully managed multi-server solution that delivers the flexibility and scalability you need for your web-based application. 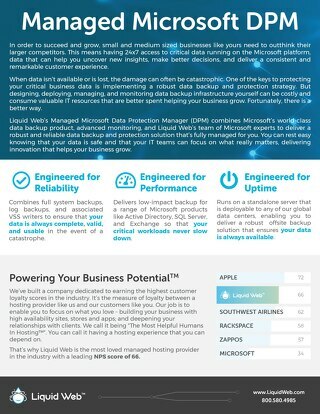 The Managed Microsoft Data Protection Manager (DPM) combines Microsoft’s world-class data backup product, advanced monitoring, and Liquid Web’s Microsoft experts to deliver a superior backup product. 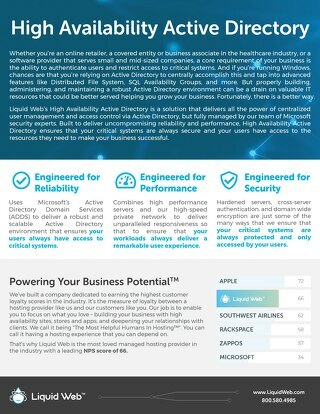 The High Availability Active Directory is a solution that delivers all the power of centralized user management and access control via Active Directory and is managed by our Microsoft security team. 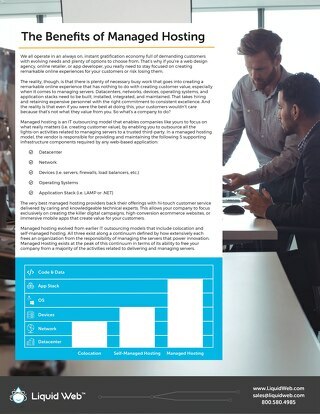 Managed Hosting is an IT outsourcing model that enables you to focus on what really matters while hosting experts handle the data centers, networks, devices, operating systems, and application stacks. 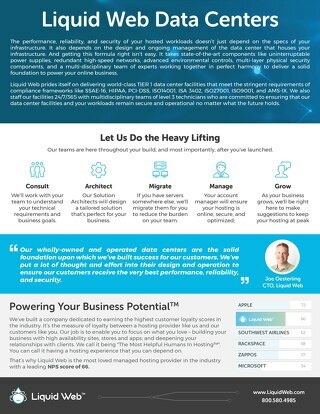 Liquid Web's Managed Web Cluster provides you with the seamless horizontal scaling you need to add front-end web resources as demand grows while providing a remarkable user experience to customers. 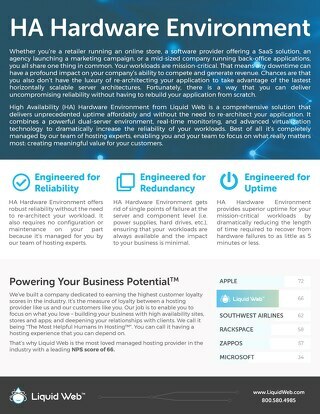 If you are running an eCommerce or WooCommerce store, a SaaS solution, or a mid-sized company running a back-office application, our High Availability Environment will keep your solution online. 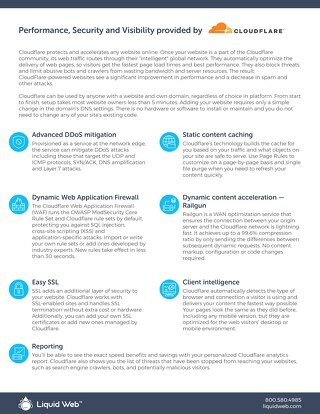 Cloudflare protects and accelerates any website using the Cloudflare community but routing traffic to "intelligent" locations that are closer geographically to your customer than your server. See how. 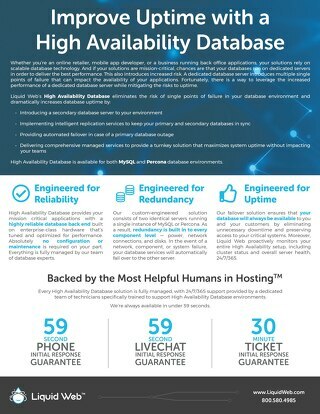 The High Availability Database eliminates the risk of a single point of failure to your database environment with intelligent replication services, automated failover, and Fully Managed services. Every day the number of security threats expands, and so does the complex nature of these attacks. A Managed Firewall can help as your first line of defense against malicious internet traffic. 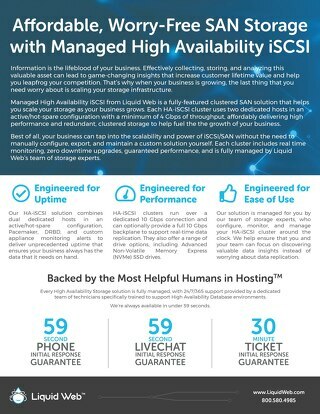 With a Managed High Availability iSCSI from Liquid Web, you gain the scalability and power of an iSCSI/SAN without the need to maintain a custom solution yourself. See how. 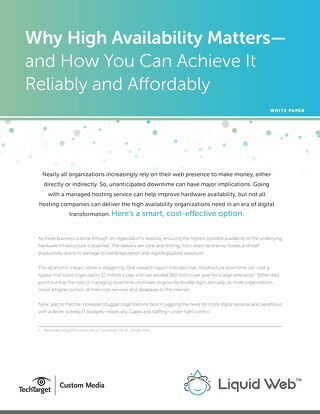 When your organization generates all or the bulk of its revenue from your website, ensuring high availability of your site is critical for your business. Liquid Web's High Availability is the answer.